Epoxy and quartz aggregate consists of a clear 100 % solid epoxy with colored quartz aggregate blends broadcast into the clear epoxy. Our base system is a standard, double broadcast, 60-80 mils (nominal 1/8 inch) thick. We also offer a thinner, single broadcast system, at 40-60 mils (nominal 1/16 inch) thick. Chemical resistant urethane (CRU), is a solvent based product that will not affect the texture greatly, but will enhance the chemical resistance, and UV stability. This would be an additional top coat. The CRU comes in two finishes: glossy, and satin. Epoxy and colored chip flooring consists of a clear 100 % solid epoxy with colored chip blends broadcast into the clear epoxy. Our base system is a standard, double broadcast, nominal 60 mils (nominal 1/16 inch) thick. We also offer a thinner, single broadcast system, at 20-30 mils (nominal 1/32 inch) thick. 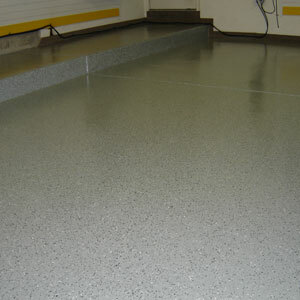 Chemical resistant urethane top coat (CRU), is a solvent based product that will not affect the texture greatly, but will enhance the chemical resistance, and UV stability. 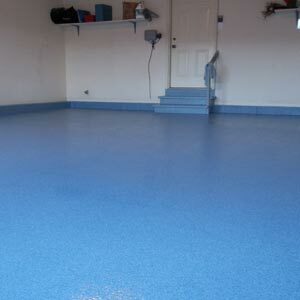 This is a standard part of this flooring system. The CRU comes in two finishes: glossy, and satin, gloss is the stadnard finish.